According to Environment Canada, atmospheric sulphur dioxide emissions were reduced by over 50% from 1990 to 2010. Although this is a positive outcome for emissions reductions it does signal an inevitable need to ensure that field crops have an adequate supply of this essential nutrient. 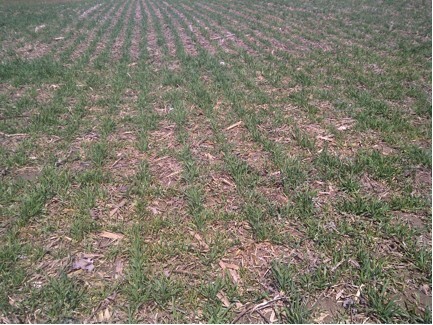 A study was initiated in 2011 to determine how varying rates of sulphur affected winter wheat yields. 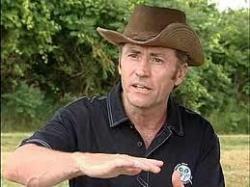 Sulphur response varied significantly from site to site and year to year. Average yield response was 3.3 bu/ac over the two years of the trial (Table 1). 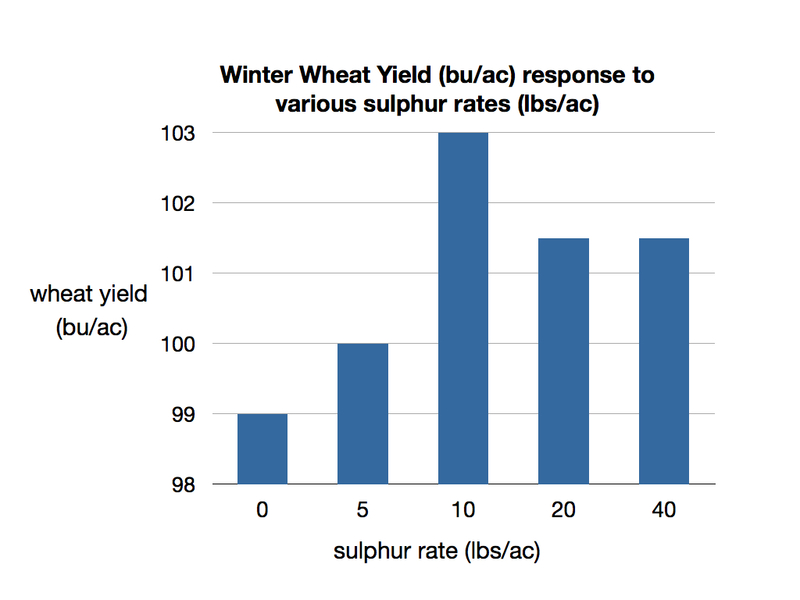 Sulphur response in 2011 was significantly higher (5.1 bu/ac) than in 2012 (2.5 bu/ac). This is supported by trials across the industry where 28 trials in 2011 averaged a 5.5 bu/ac response, and 29 trials in 2012 averaged 2.3 bu/ac response (data not shown). A significant year effect was observed with the spring of 2011 being cool and very wet while the spring of 2012 was warm and dry. Exactly how the variation in environmental conditions affected the availability of sulphur for the winter wheat crop is not clear. Yield response of the 6 responsive sites show maximum benefit at 10 pounds/acre of sulphur, with no additional yield gain from increased sulphur rates (Figure 1). This is a critical finding, as it gives an application level above which growers can expect no response. With variable winter wheat yield responses across locations and years, many growers will opt to apply some sulphur. A yield penalty of 20 bu/ac has been observed when no sulphur is applied on deficient fields. If a small amount of sulphur can be applied to avoid a significant yield loss, and average yield gain will cover the cost of this application, many growers will consider this a reasonable “insurance” application. 10 lbs/ac sulphur would appear to be that breakpoint. Can you take tissue samples to predict optimal rate of sulphur? Tissue samples were taken at three stages of crop development to evaluate critical tissue concentrations. Unfortunately, crop development stage had tremendous impact on sulphur concentrations in the wheat plant. For example, Sulphur concentrations increased from 0.20% sulphur at the tillering stage (Zadok’s 21) to 0.50% sulphur at the heading stage. Therefore the critical sulphur value will change as the crop advances through its growth stages. Currently there is not enough data to support an optimal rate based on tissue analysis at varying growth stages. This study, supported by the Grain Farmer of Ontario, Agriculture and Agri-Food Canada the University of Guelph and the Ontario Soil and Crop Improvement Association will continue during the 2013 growing season. The preliminary report can be found here. Related articles: Sulphur: more than just a secondary nutrient?